Adopting controlled traffic and bringing fertilizer application in-house has given Iowa strip-tillers Ron and Kevin Neuberger flexibility to trim input costs and improve efficiency. When Ron Neuberger moved from conventional tillage to strip-tilling corn and no-tilling soybeans 10 years ago, he set modest goals. As a single farmer planting about 1,300 acres in Ackley, Iowa, Neuberger wanted a more efficient way to prepare fields in the fall and plant in spring. Some of the early returns for Neuberger included time and fuel savings of not having to run a field cultivator. Eventually his son, Kevin, joined the operation and during the last several years they’ve gradually expanded and evolved their strip-till system. SETTING GOALS. 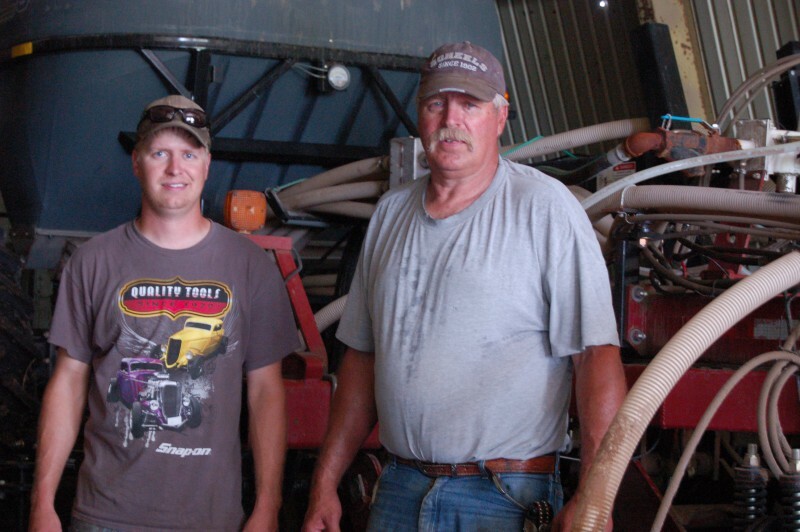 Ackley, Iowa, strip-tillers Kevin Neuberger (l) and his father, Ron, focus on preserving soil structure and increasing soil health through controlled-traffic and fewer fertilizer applications. They run the majority of their machinery in a controlled-traffic system to minimize compaction, and are now focusing on fine-tuning fertilizer quantity and placement as ways to save money and make nutrients more available for corn plants. For years, Neuberger relied on a local co-op to bulk spread potash in the fall, and he would then use his 8-row Case IH strip-till bar, with Yetter Maverick row units, to apply 16 to 18 gallons per acre of liquid ammonium phosphate (10-34-0) in the strips, about 2 inches above the anhydrous. But last year, he decided he wanted more flexibility with fall fertilizer application. So he built a new 12-row strip-till rig using an old Case IH 950 front-fold planter bar, and attached the Yetter row units. 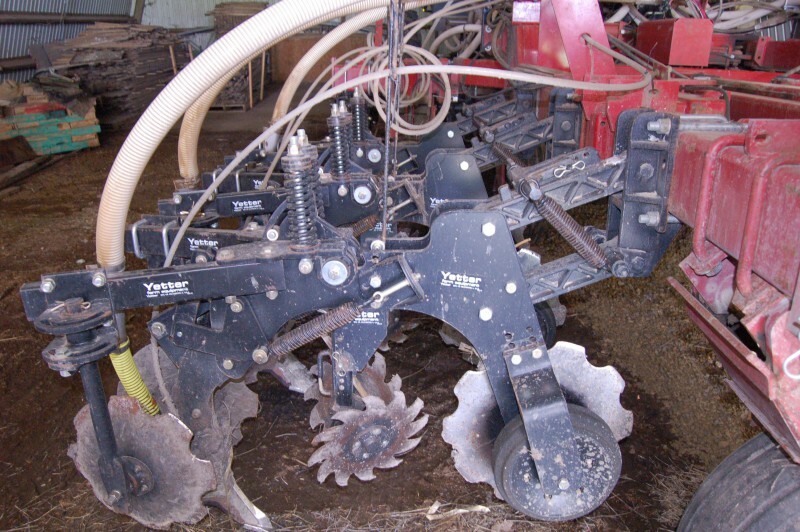 The Neubergers then added a pull-type Montag dry-fertilizer cart to the strip-till rig, which let them bring their corn fertilization program entirely in-house and reduce the number of applications they were making. DRYING OUT. 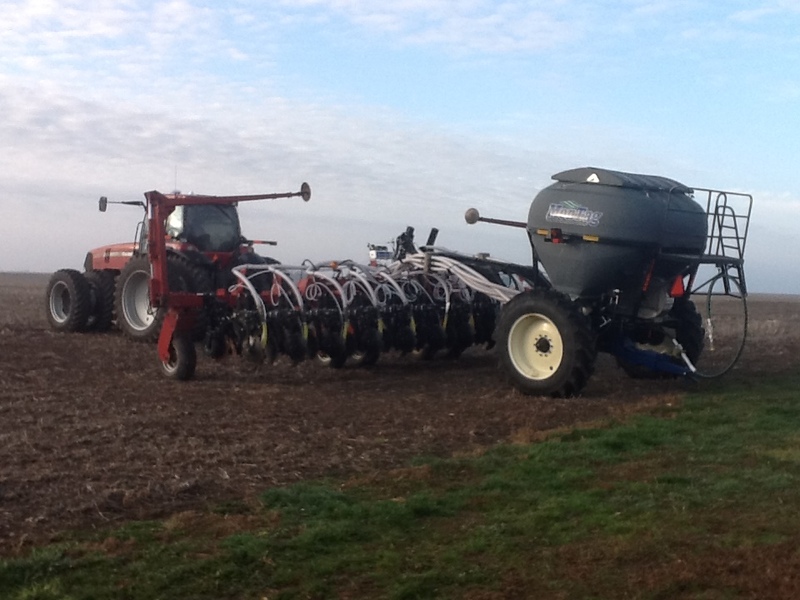 After years of applying liquid fertilizer with their strip-till unit and having a co-op bulk spread potash, this past fall, the Neubergers added a Montag pull-type dry fertilizer cart to their 12-row rig to bring their fertilizing program in-house and be more efficient with applications. Based on grid-sampling results, last fall the Neubergers applied 250 to 300 pounds per acre of phosphorous and potassium, mixed with micronutrients, and about 150 pounds per acre of anhydrous with the strip-till rig. Then in spring, they applied 3 to 4 gallons per acre of 10-34-0 as a starter with their 12-row Case IH 1250 corn planter. Although it was their first year applying dry fertilizer with this setup, Neuberger says he’s seen encouraging results in the field. While they still use the co-op to spread potash for no-tilled soybeans, the Neubergers expect to save money and fertilizer with the recent modification to their strip-till fertility program. Whether a yield boost is also part of the equation remains to be seen. In addition to building a consistent fertility program, the Neubergers are taking steps to preserve soil structure and improve soil health. Years of tillage took its toll on the predominantly Clarion loam soils in their area. The move helped reduce erosion, but the Neubergers took additional steps to address compaction. Soon after moving to conservation-tillage practices, they began implementing controlled-traffic patterns to establish consistent driving lanes. EVOLVING EQUIPMENT. The Neuberger’s started with an 8-row strip-till rig and have since moved to a 12-row machine using an old Case IH 950 front-fold planter bar with Yetter Maverick row units to fit their controlled-traffic system. It’s taken some effort to get equipment matched up, but the Neubergers currently run their 12-row strip-till rig, 12-row corn planter, 24-row Case IH 955 soybean planter and Case IH MX270 tractor on the same lanes. For corn, they plant on 30-inch spacings and for soybeans, they plant in 15-inch rows, using RTK to plant 7½ inches on either side of the corn stalks. They use Ag Leader’s RTK 2500 RTK base station receiver for guidance and get their signal from the Iowa Department of Transportation’s Real-Time Network. Neuberger has plans to incorporate his Top Air pull-type sprayer into the controlled-traffic system. So far, he’s seen incremental improvement in soil health, with increased earthworm activity and fewer compacted areas, but has yet to dig deeper on testing organic matter or pH ranges — though he plans to in the future.